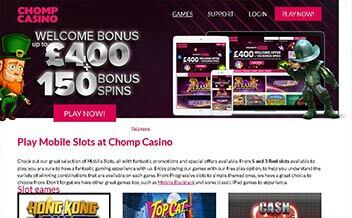 Chomp Casino has strived to become known ever since establishment in 2011. Having over 500 online casino games from slots to table games and having good bonuses, it has become popular over the years and it accepts players from all over. The casino has managed to bring fun to the gambling industry. The many slots and games they offer ensures players get a good experience trying them out. Players therefore can try out games getting assurance of playing requirements being taken care of. There are a number of progressive jackpots available that could see login players win millions of pounds. Players get a chance to have a good gaming experience and still get a chance to earn money. Mega Moolah, Siberian Storm, Cleopatra, Isle O’ plenty, and Wolf Run are among these progressive jackpot games. More than 180 slots are available. They include Best of British, Cave Raiders, Gonzo’s quest, Miss Midas, Medusa 2, Candy Swap, Merlin’s Magic and, Candy Swap only to name a few. You can also enjoy slots from major gaming providers like NextGen such as Irish Eyes 1 and Irish eyes 2. The casino offers a variety of table games to ensure that every gamer has a chance to enjoy their casino experience. Players can select between Classic Blackjack and Roulette variants and three scratch cards just to mention a few. The table games are of good quality to make it more exiting. Video poker games available include Jacks or Better, Deuces Wild, Joker Poker, All American and so on. Players also get to enjoy video poker games from Micro gaming providers like Pai Gow, Sic Bo, Keno, Cyberstud Poker, Bingo, Double exposure, Spingo, Texas Hold’em, and 3 Card poker among others. There are no live casino games. 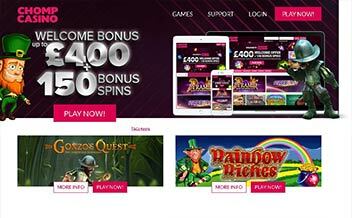 The first deposit provides one with a 100% catch-match up to £ 150 worth free 50 spins. This bonus is attractive for any new player to pass. The second deposit also provides a 100% cash-match up to £150 and free 50 spins. While the third deposit provides a 50% cash-match up to £200 with free 50 spins. The bonus should be wagered 30× before cashing out. The maximum one can win from bonuses is five times bonus amount. A player has only 28 days to meet wagering requirements. There are certain games which you cannot use the bonus credits on. The VIP scheme comes in three flavours. That is VIP, Premier and Elite. For VIP treatment, one gets priority customer service. Premier and elite are provided with a personal account manager. 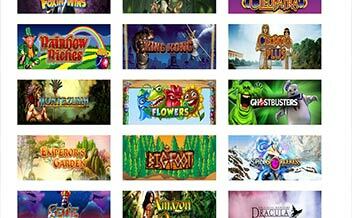 Chomp Casino has managed to entertain their clients by adding new games, slots and bonuses on their site. For both regular and new players, time should be created to go through the site to learn of the latest details. This enables one gamblers to play latest games and also stand a chance to win amazing prizes and bonuses. For this purpose, this section has been put aside to make sure clients are up to date. The casino works with a number of main providers in the market offering players with high quality games. The main providers include Nekton, NE tent, Neaten and NYX. Others include Micro gaming, interactive, Blueprint, IGT, Folium, Iron Dog Studio, Felt gaming, Extreme live gaming, ELK studios and scientific games. 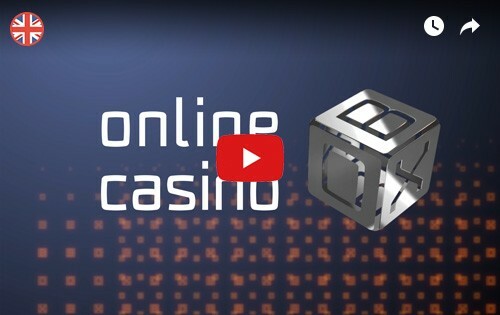 The casino is specially designed to suit mobile and desktop users. With these devices, a gamer can be able to play games at any time. A majority of the common browsers can be used to get content provided. This includes Mozilla Firefox, Google chrome, safari, opera and others. For personal computer users, operating systems such as Mac OS, Android and windows can be used. The website design is plain in nature featuring clashing bright pink and green colours. The menu is provided for at the homepage enabling clients to easily get what they are looking for. Navigation through the site is easy as features are limited in the homepage. The simplicity of the website ensures that players, especially the new ones do not get confused. Players at Chomp Casino should not worry at any time about their security as their personal details are kept secure at all times.  Thhe technology used is SSL encryption that uses strict processes. Gamers’ sensitive information such as financial records, passwords and banking information is obscured when travelling from your computer to the server. The slots game s and tables use random number generator which randomly generate results. This ensures fair play every time. 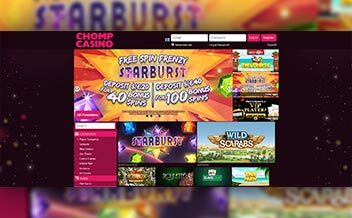 Chomp Casino has made sure that players are comfortable every time by providing them with the support they need. There are a number of options players may use when seeking support. The first one is chat with the supporters by contacting them. There are telephone numbers provided on the website gamers can get in contact with the agents anytime. You may also write an email and wait for your query or concern to be answered after a short time by the team. The welcome bonuses offered at the casino are attractive. However, the selection of games needs to be worked on. The distinctive lack of live dealer games is a disappointment to a number of players. The cashier options are less and there is no live chat support which counts significantly against the casino. The 3 tier VIP program is an aspect that provides players with a lot of benefits allowing many to keep on playing to enjoy.